A crazy mix of April Fools Day and Halloween … apparently. A day when it is kind of okay ( it’s not ) to balance a bucket of bananas on top of a door because that’s not dangerous or to jump out at a family member or friend while wearing a Scream mask and pretend stab them with a plantain. But if you want to celebrate Banana Day without getting arrested why not dress up as a banana and perform a routine from that banana musical you wrote when you were drunk … unless work has a policy on fruit based song and dance during core hours. 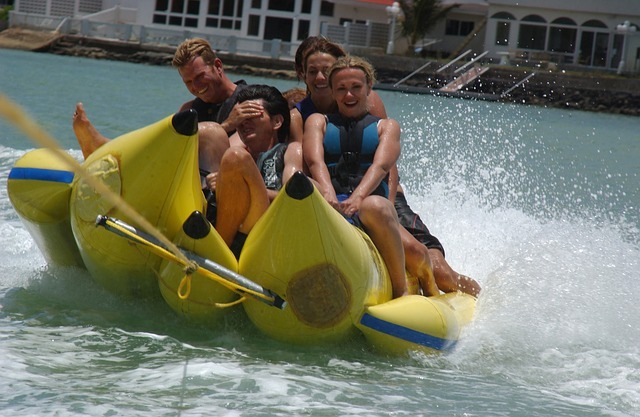 Here are 10 suggestions to help you celebrate Banana Day without getting arrested … maybe. 1. Bananas are naturally radioactive, so don’t make them angry cos … you know … rampage. But perhaps you could turn up at the breakfast table to tackle your morning muesli wearing a hazmat suit … before realizing the air tight flaw in your air tight plan. 2. A bunch of bananas is known as a Hand Of Bananas. Why not try and get through your day using banana hands instead of your actual hands. 3. Precut your victim’s banana without peeling it. Pierce the banana with a clean or sterile needle, then move the needle back and forth to slice the fruit inside … and repeat. 4. Run a marathon dressed as a banana. The fastest marathon run while dress as a fruit was by Patrick Whitman of the UK who finished the 2011 Barcelona marathon in 2 hours 58 minutes and 20 seconds. 5. Hawaii is the only part of the US where bananas are commercially grown. Celebrate this by making a grass skirt out of bananas to do the hula in. 6. Banana trees are not trees, they are herbs ( the largest herb in the world ). Complain at your local herbalists ( for fun, of course ) about why they don’t stock banana trees. 7. Bananas are berries. Wear a yellow beret and pretend to be French for the day. Enjoy adopting a French accent, spoofing aloofness, making up unfathomable Nietzschian philosophy and, at restaurants, rudely suggesting that classic dishes are inferior because they do not contain bananas. 9. Banana ‘trees’ walk. Because of how the commercial plant grows, it can move up to 40 centimeters during its lifetime. So, if you have a game of charades scheduled for today and you particularly want to win, mime a banana ‘tree’ by moving 40 cm very slowly before dying. … Anything for the win. 10. Bananas are the songiest fruit. More songs have been written about bananas than any other fruit. So get those creative banana juices flowing and write that tribute song. Keep bananas on top.